The Riverside Guest House boasts a collection of old wooden buildings and a garden setting right on the river, making it exactly what the flashpacker set and families travelling with children are looking for. Ad Book now! Rates from US$26.7++. Average rating 8.2 from 371 reviews. The guesthouse has a central location on Talat Kao Road in Lampang’s old town, where a walking market sets up each Saturday and Sunday afternoon. All rooms are tastefully designed with dark polished woods, exposed bricks, soft lighting and classy Thai art. Each comes with WiFi and private sitting area. Our only minor gripe is that, like many old wooden houses, walls are on the thin side. A total of 20 or so rooms are offered, ranging from cheap fan-cooled editions with shared bath, through to a luscious air-con suite. We’ve seen practically all of the rooms and have found no two to be exactly alike, and this is reflected in the guesthouse’s complicated pricing system. They also offer a cafe-style restaurant, fairly good scooters and bicycles for rent (200 and 60 baht respectively), and tour services for exploring the area. It is important to note that the gate is locked at midnight. The riverside terrace and garden is filled with tropical plants so a great spot to enjoy a coffee or tea while watching the water flow past. 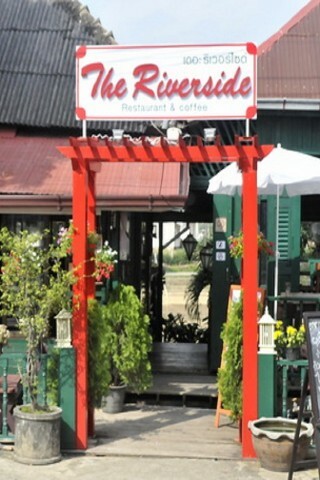 The Riverside is often full in high season so it’s a good idea to book ahead of time.